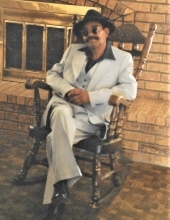 Mr. Jose "Pancho" Garcia, of Hereford, Texas, passed away Thursday, March 21st at the age of 66. Mr. Garcia was born to Enrique and Angelita Martinez Garcia on March 14, 1953 in Taft, Texas. The family moved to Hereford in 1958, and Pancho completed his education through the 8th grade here. He met his beloved wife Ofelia in 1970 and the couple married soon after on November 22, 1970. They’ve been together over 48 years. He worked most of his life in concrete construction with his brother as Garcia Brothers Concrete Construction. He loved to joke and always had something funny to say in his quiet way. Pancho loved to go fishing in his spare time. He was a giving man and loved his family; he was especially fond of spending time with his grandchildren. Mr. Garcia was preceded in death by his parents and his brothers Nicolas and wife Maria Garcia, Valentin Garcia, Marcos Garcia, Gregorio Garcia, and by his sister Agapita Cantu. He leaves behind his wife Ofelia, his brothers Primitivo and Nicolas Garcia of Hereford, Texas, Enrique and wife Amelia Garcia of Hereford, Texas, and sisters Teresa and husband Jim Hastings of Hereford, Texas, and Avarista and husband Norman Forbes of San Juan, Texas. Pancho’s three children also survive him: Adela and husband Marcos Rodriguez of Amarillo, Texas, Noah and wife Caryn Garcia stationed in 29 Palms, California, and Alma and husband Cory Dewbre of Hereford, Texas, as well as eight grandchildren: Ariana and Marissa Rodriguez, Gabriel and Nathaniel Garcia, Serrina and R.J. Montano, and Aiden and Arion Hubner. Five great-grandchildren: Sophia Garcia, Aviana Santes, Rayden Montano, Xander Garcia, and Kayden Montano and many nieces, nephews, cousins, and friends also remain behind to celebrate his memory. Fr. Nestor Lara will be the Celebrant. "Email Address" would like to share the life celebration of Jose "Pancho" Garcia. Click on the "link" to go to share a favorite memory or leave a condolence message for the family.